On warm, dry, breezy fall days, whole plant moisture can drop up to 2% per day. If you have not done so already, check the maturity and moisture level of your corn. Aim to harvest within the 30-35% dry-matter window. If you have a bumper crop, consider chopping higher for a higher energy corn silage product that can help you reduce your feed bill. Depending on whether you have a kernel processor, keeping the theoretical length of cut between 3/8” (without processing) and 3/4” (with processing). Keep in mind all the ways “shrink” happens on the farm and take steps to minimize losses. When packing, don’t hurry, and make sure you have enough tractor weight to get the job done well: total tractor weight (for all continuously packing tractors) divided by 800 equals the number of wet tons you can pack per hour. Oxygen exclusion will be maximized when: plastic is thicker; multiple layers are used; an oxygen barrier is included; and if the covering is adequately weighed down (tires should be touching). Start on time: We often think of whole plant corn silage drying down at a rate of 1/2%? per day; on warm, dry, breezy fall (or late summer) days, whole plant moisture can actually decrease by 2% per day, and the optimal point to begin harvest can sneak up on us. This is particularly likely after a hot summer. Silage made from over-mature corn affects quality in several ways that combine in various ways to harm your bottom line: higher fiber, lower digestibility, more shrink (difficult to pack, more oxygen entrapment and spoilage). For bunker silos, harvesting the corn when it is 30 – 35% dry matter will maximize the opportunity for attaining a packing density of 15 lb/ft3or more. Cutting height: This obviously does not pertain to shrink, but needs to be mentioned (again). Corn prices are at record high levels. You could offset some of that cost by chopping your corn higher than usual. That will obviously result in a lower total yield, but many farmers in some parts of the Northeast have the best corn crop that they have ever had. The choice may be between chopping higher to improve quality and reducing your grain bill, or chopping low and having enough corn silage to sell. Depending on where you are, selling corn silage may not be as easy as it is in some years. Understand “shrink”: If a couple of cucumbers spoil in the refrigerator once in a while, nobody gets too upset. If 40%+ of the food is lost or spoiled, the household managers tend to get excited. Brian Holmes, a University of Wisconsin Extension agricultural engineer demonstrates that even under ‘good management’ 18% of the harvestable corn silage in your field never makes it into the digestive tract of an animal. Under ‘not so good management’ almost 29% will never make it into an animal. Using a spreadsheet (see references below), Holmes neatly demonstrates that on an 85 cow dairy, the difference between 19 and 29% loss amounts to almost $17,000/year! Sources of loss include harvest, filling, storage, storage feed-out, and feeding practices. Chopping length and kernel processing: Fermentation is an anaerobic process. The more air space you have among particles in the silo, the more spoilage you can expect. Crop processors allow kernel-cracking to take place without having a suboptimal theoretical length of cut (TLC). Without a crop processor, a 3/8” TLC is necessary to adequately damage the kernel to optimize starch utilization in the system. With crop processors, the TLC can be increased without affecting starch digestibility; while increased fiber length improves rumen health, having a TLC longer than 3/4” makes achieving an optimal packing density more difficult. Kernel processing improves starch utilization and reduces cob fragment size to prevent sorting during feeding. Limin Kung, Jr., a noted silage expert from University of Delaware, suggests that processing is adequate if 90-95% of kernels are cracked or crushed (70% less than 1/4 kernel size) and if the cobs are in at least 8 pieces. Packing: Chopped corn often shows up at the bunker faster than we think. Packing layers should be less than six inches thick to prevent excessive trapping of oxygen. 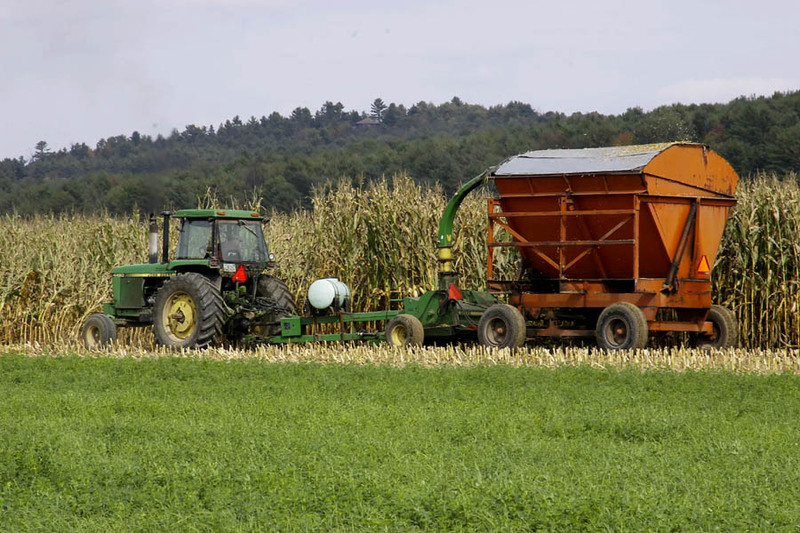 A University of Wisconsin formula suggests that the number of wet tons of silage a continuously packing tractor can adequately pack can be determined by dividing the weight of the packing tractor by 800. If packing is your bottleneck, it is better to add weights to the tractor, add another tractor, or slow the chopper down rather than to inadequately pack the material going into the bunker silo. Keep this in mind if you are using custom harvesters who may be able to harvest much faster than you can pack. Covering to Exclude Oxygen: Some farmers do not cover their bunker silos, others plant rye on top, thinking that will help somehow. Inadequate oxygen exclusion from the top can lead to storage losses over 30%! White plastic is better than black (lower temperature), thicker (8 mil) is better than thin plastic (4 mil), two layers are better than one, and oxygen-barrier plastic is ideal. The covering will not function as intended unless it is weighted down adequately. A well-weighted cover that includes an oxygen barrier may have as little as 1-2” of spoilage on the top compared with 12” in poorly covered or uncovered bunker silo. For the most part, the biological shrink between the field and the digestive tract of the animal is due to microbial degradation of highly digestible nutrients. The only way to compensate for low quality feed is to purchase grain. Take an inventory of each step of your silage making practices and note opportunities for improvement. This will be a giant step towards keeping your feed costs as low as possible.